By Kori ~ October 4th, 2010. Woodinville has definitely become a must-visit destination in Washington wine country. Home of the stateâ€™s oldest, largest, and most well-known wineries, Chateau Ste. Michelle and Columbia Winery, the Woodinville area is also home to over 90 wineries and tasting rooms, with new ones opening all the time. 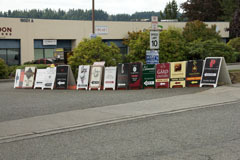 Woodinville now boasts the second largest concentration of Washington wineries after Walla Walla and is located just 17 miles northeast of Seattle. Today, Woodinville is one of the Seattle areaâ€™s top tourist attractions, with at least 18 tasting rooms open daily and upwards of 70 open on the weekend. I am not aware of another place in the U.S. where there are this many fine wineries so close to a major city. Due to its close proximity to Seattle, we have visited Woodinville several times in the last month or so. We focused our visits predominately on wineries whose current Woodinville tasting rooms we had not previously visited; although, in many cases, we have tasted their wines at one time or another. In addition to these visits, we also recently had an extended visit and interview with Rod and Leslie Balsley at William Church Winery and attended the Woodinville Wine Country â€œTaste for the Tradeâ€ event in Seattle. We capped off our most recent visit to Woodinville as guests of Chateau Ste. Michelle for a fabulous Harry Connick, Jr. concert that was a part of their Summer Concert Series. Obviously with over 90 wineries and tasting rooms in Woodinville today, it is impossible to visit them all in an afternoon or even a long weekend. However, there are several areas with concentrations of wineries/tasting rooms within Woodinville that makes it easy to focus your visits on different areas. You may want to visit the warehouse district one day, the Hollywood Schoolhouse area another day, and the stand-alones (Chateau Ste. Michelle, Columbia, Novelty Hill/Januik, etc.) another day. 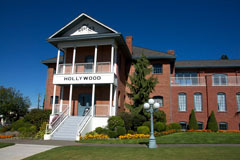 No matter where in Woodinville you are going, if you do not like crowds and would rather avoid the limos carrying bachelorette partygoers, you might want to visit on a day other than Saturday. Hereâ€™s a breakdown of the wines that we tasted during our recent visits to Woodinville. Under each Quality heading, the wine name and region will be listed along with price and QPR rating. 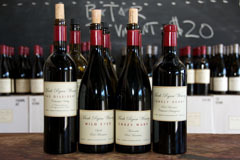 Wines in bold type received a QPR rating of 5 bangs for your buck (out of 5).